Abriana Jetté is an internationally published poet, essayist, and educator from Brooklyn, New York. Her work has appeared in dozens of journals, including the Dr. T. J. Eckleburg Review, The Iron Horse Literary Review, The American Literary Review, and 491 Magazine. 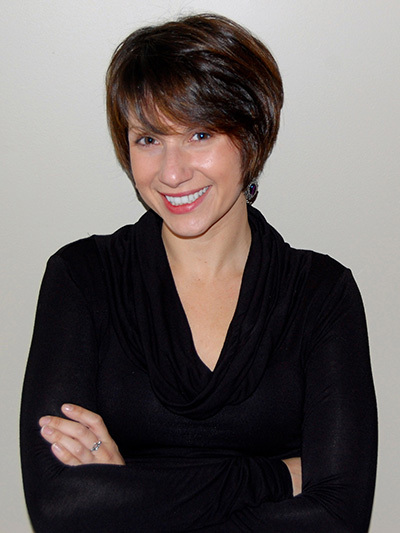 She teaches at St. Johns's University and the City University of New York, writes a regular column for Stay Thirsty Magazine that focuses on emerging poets and she is the editor of the recently published book, The Best Emerging Poets of 2013, that debuted on Amazon as the #3 Best Seller in Poetry Anthologies. THIRSTY caught up with her at her home in Brooklyn for this conversation. THIRSTY: Poetry seems like the perfect art form for our ADHD world where a writer can tell a story and convey an emotional experience in a brief but meaningful way. Do you think the millennial generation will embrace poetry more enthusiastically than their parents' generation did in part because of how they lead their lives in a hyper-fast, electronically connected world? ABRIANA JETTÉ: In some way I do believe it's true that today's youth live through sound bites. They've developed quick, abbreviated colloquialisms, metamorphosing language into letters (just think: LOL, BRB, TBT), which, we can safely say, have been adopted into the national conversation. Perhaps it is the blessing of teenagers to not fully understand the profound influence they have on the trends and demands of a culture. Part of this question is tricky to answer because throughout the hours of my every day, poetry is everywhere; I carry it with me wherever I go. Literally, there is always a book in my purse, and figuratively, a line is never far, echoing about my mind. Today, there are some really innovative journals that bring poetry into the palms of readers' hands: journals that text poems to cell phones, journals that offer online courses with award-winning writers, and of course journals that have apps to download straight to any smart phone. One particular journal, Brevity, tailors to the needs of what you refer to as this "ADHD world," and only publishes short, concise stories under 500 words. I can only hope that the millennials will take advantage of the positive influence the worldwide web can have and its worldwide power. In short, though, I believe poetry is the perfect art form for any society, that a society without poetry is impossible. Poetry is the language that connects us all, whether it be through music, SLAM, graffiti, or commercial jingles. Even in the most oppressive nation there is someone with a voice, with a pen, with a phrase linked to another, yearning to be heard. THIRSTY: Why did you choose to focus your anthology on emerging poets rather than those more established? What qualifies a poet as "emerging" in your mind? ABRIANA JETTÉ: I'm the type of person who tries to stay away from categorizing and defining terms when it comes to art. When considering "emerging" rather than "new" or already established poets, it really comes down to publication history. I believe publications of some sort are important, not because of any literary merit, but because the zest and effort required to put work out in the public demonstrates a poet's determination to share his/her voice. That being said, a long history of publications is not necessary, I simply want the poems to be published so that I may quote from them freely, and so that I don't inhibit the poet's chances of publishing in the future (many journals require first serial rights). I look for voices that feel like I'm sucking on a lemon while reading, voices that stick to my teeth and shake me wholly. I also try to focus on poets who are actively engaged in the field. Another distinction between emerging and established poets belongs to the fact that the poets I feature do not have full-length poetry collections published – though they should, or will. Interestingly enough, some of the poets who I have featured as emerging poets in my seasonal column for Stay Thirsty Magazine received book contracts not long after, which is, of course, the goal. Like I mention in the introduction to my anthology, hardly any venues exist that individually promote the work of poets who already know their voice, have learned and mastered the craft, but who have no book contract nor first book nor nationally-endowed award that will keep their career steady; some do not have degrees, or have not yet finished writing a manuscript as these things take time, years, a luxury early writers, working many other jobs to pay the bills, seldom have. I feel very lucky that I get to promote poetry I believe can be read over and over again, it feels like a beautiful responsibility, to seek and spread powerful art. THIRSTY: How did you decide which poets to feature in The Best Emerging Poets of 2013? ABRIANA JETTÉ: It's a fairly simple process that I base off my column, which highlights the work of three to four emerging poets each season. Organizing the poets for columns is a longer process, and I feel I have been doing it for years, folding pages of journals and anthologies of poems that have jazzed me and shimmied my brain. If the poet is able to release his/her work, which can depend on anything from publication rights to spacing concerns, I meditate with around seven to eight poems from each poet, and try to choose the ones which mingle nicely, and which when put together, electrify the mind and page. I really believe The Best Emerging Poets of 2013 surpasses the standard expectations of an anthology: it is a book from which to learn the craft, and inspires the earliest of readers to the most experienced. THIRSTY: Several of the emerging poets in your book graduated from the Boston University M.F.A. program. Is there a Boston University school of poetry emerging? ABRIANA JETTÉ: I wouldn't necessarily say that there is a Boston University school of poetry, I would say that the M.F.A. at BU is tailored to creating a neighborhood of educated, determined, and already talented writers. Like Leslie Epstein, Director of the Creative Writing program, says, it "is not a place for leisurely discovery", but for committed writers of fiction and poetry. The unique M.F.A. at BU, I think, taught me the definition of what it means to be an emerging writer. Its small class size and variety of culture, age, and voice, consistently brings together effective and intriguing cohorts. Even though I was born and raised in Brooklyn, and New York City was my backyard, the community of artists (writers, painters, and philosophers alike) in Boston is unlike any other I've encountered. Nationally acclaimed writers read for free on any given day, the street performers have a soulful purpose in their song – it's never just for spare change in an empty cap – I don't know how to articulate it, really, but it's true, something about the city's streets exudes a passion for the arts and art history. I think when you consider contemporary poetry in America today you have to consider Boston. THIRSTY: How has the poetry of today influenced music or is the reverse true? Or, has there been no recent cross-pollination between the two? ABRIANA JETTÉ: What an interesting question. To start off it is important to me that we understand no one is perfect. In every genre, in any walk of life, there are going to be a few bad seeds that mess up the harvest for a short while. Perhaps this is a good analogy for what I believe is happening to hip-hop and pop music today. Too large of a portion of the songs ranked in Billboard include lyrics that, grammatically, are atrocious, and include content that glorifies misogyny, devalues education, and promotes extreme violence. But even after a bad harvest a few crops can be saved. The radio lacks range. Songs are mostly electronically enhanced and fast-paced, inducing chaos within listeners with their disjointed lyrics and quick, nonsensical beat. But there are those few songs and bands who have deconstructed their sound by embracing the style of the folksong, which for many cultures, was the first type of poem. More and more I hear lyricists turn to chiasmus, a rhetorical device commonly found in the King James Bible, a device that denotes a reverse parallel of syntax. Don't get lost –think about the proverb "do unto others as you would have others do unto you." The switching of "do unto", its placement in the front then end of the sentence, is what I mean when I speak of reverse parallelism. Do these lyricists know they are utilizing this rhetorical device? I hope so. Does it matter? Well, I think it does. Knowledge is mastery. And mastery is as close to perfection as the artist can get. All artists should make it their personal responsibility to master their craft: painter, poet, rapper, sculptor, and anything in between. I have the same demands for poetry as I do for music, for movies, plays, novels, and choreography, and why should I not? Any form of art should exude and heighten emotion from us. It should make us think. I try my hardest to have my poetry and criticism appeal to a wide audience. 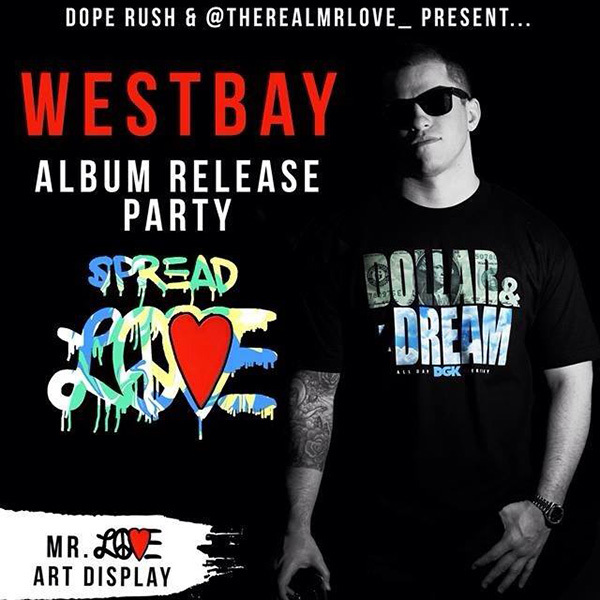 Actually, The Best Emerging Poets of 2013 was promoted at the album release party for up and coming rapper, Westbay, whose album Spread Love, inspired by the Notorious B.I.G. 's line "Spread love, it's the Brooklyn way", calls upon a movement the rapper has undertaken with New York City street artist Mr. Love to revive the spirit of old school hip-hop. Their mission of positivity through music is one I hope catches like wildfire. It is the type of motto the millennials need. I was delighted to be part of the event, during which rap, poetry, and art shared the same space. I used to teach at the John. F. Kennedy Honors high school the Boston Arts Academy, and many of my students wrote and performed their own songs. I know there are outstanding musicians out there, tremendous vocalists, drummers, guitarists – it's just going to take an underground revolution to get them to the top, a trend against the popular, perhaps. In a sense, these emerging artists just need an extra push. THIRSTY: Should poetry become a performance art and evolve beyond the traditional formal reading before a small audience? Should there be a YouTube "Emerging Poets Channel" where poets can perform their poetry and reach the world? ABRIANA JETTÉ: I'll use the fact that I refer to myself often as a reader and writer of poetry to answer this question. As much as I value poetry readings, pod casts, and sound bites, when I find comfort in a poem it is often from the words on the page, the shape and form, of holding and seizing the poem in my hand. Poetry has no limits: it is a performance art, rooted in oral tradition to memorialize culture. It is a personal, intimate experience, exposing feelings otherwise undiscovered. Poetry can be anything it wants to be. An "Emerging Poets" channel on YouTube would be a wonderful, innovative way to bring poetry into the ears of the millennials – though it would take a fine staff with equal poetic and technical capabilities to truly make the movement work. THIRSTY: What career choices exist for poets today? ABRIANA JETTÉ: Founders of the Emerging Poets channel on Youtube seems like one great idea! I mentioned earlier that emerging artists are notorious for working multiple jobs to get by. To make a successful living solely as a poet is a difficult, tedious, almost impossible goal. I would also be hesitant of writers whose goal is to accumulate as much wealth as J.K. Rowling: one's art should never be about compensation. Toni Morrison has talked about how she'd wake up before the sunrise, write, stand in the shower, head to her day-job, complete her tasks, eat lunch, work some more, come home, eat dinner, write, sleep, wake up and do it all over again. For the sake of getting it out. Because the characters wouldn't stop speaking to her. THIRSTY: Can we expect to see The Best Emerging Poets of 2014? ABRIANA JETTÉ: Yes! 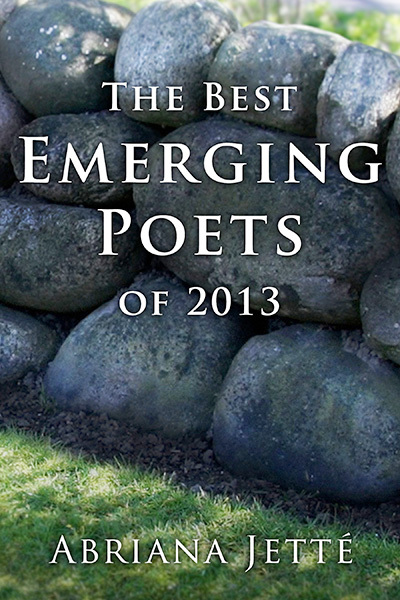 I've already started a discussion with the poets who will be included in the 2014 anthology. It's wonderful to be able to frame its core so early. Take a look at my previous and current columns on Stay Thirsty for a sample of some of the poets who will be featured. It's going to be delicious.